Join House Of on November 29th from 7:00pm - 9:00pm for a warm and cosy event! Smell candles. Sip Coffee. Listen to inspiring stories. 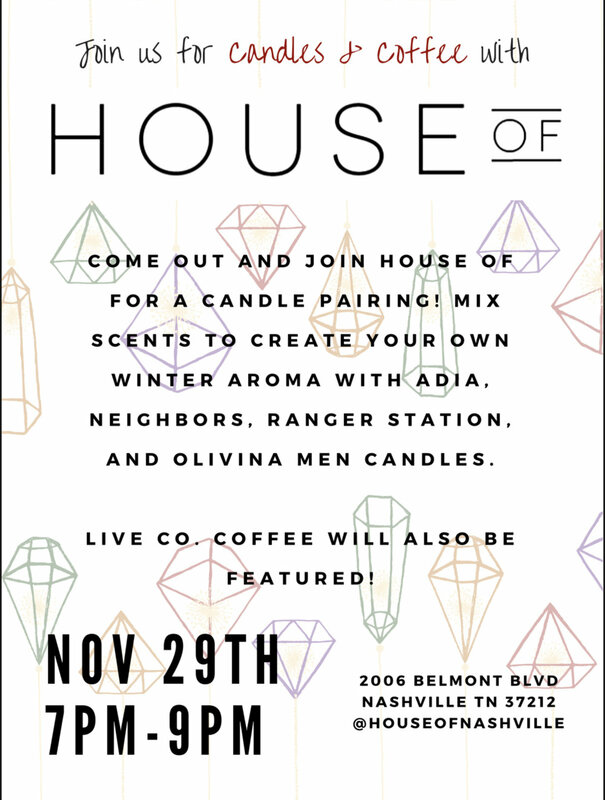 House Of invites you to come and pair different candle scents from Locally owned companies like Adia, Neighbors, Ranger Station, and Olivina Men. In addition, Live Co. Coffee will be attending! What’s so special about a candle pairing event? Don’t worry - We have something special in store for y’all. Representatives from Neighbors and Adia will be attending to tell their stories on how and why they created the scent! 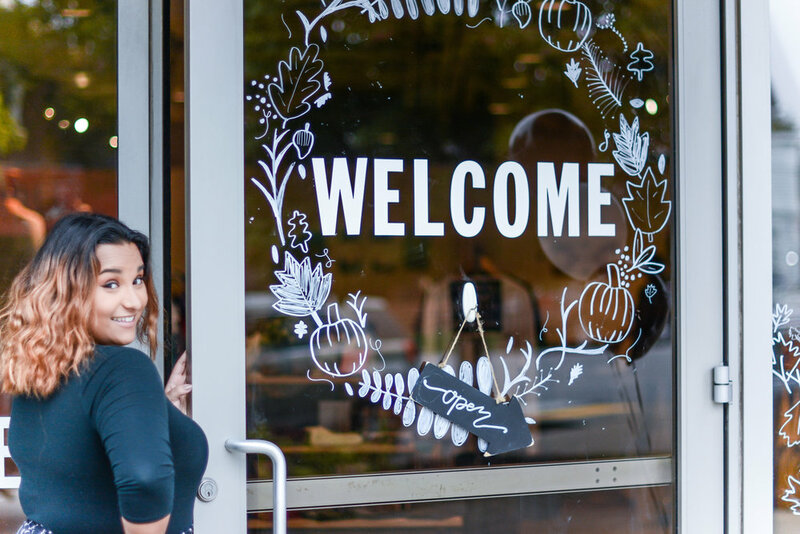 Neighbors candles are created by refugee and immigrant families right here in the Nashville community, inspired by the scents from their homes. For every candle sold by Adia, they send 50% of the profit to a charitable cause that is decided by You! Semi-annually, Adia holds a poll for various charitable organizations and causes that will be voted on through their Facebook account. That’s a wrap! House Of’s first event of the year was a success. Our very own, Delilah, welcomed people to the event. House Of was accompanied with Strings For Hope, Live Co. Coffee, Patisserie De Ciel, and a variety of musical artists including Matt Sperrazza, Trevor Allen Martin, Abbey Craine, Case Grahm, and Dakota Neuman. Strings For Hope’s CEO, Emily Winters, and Brittany Athanase. 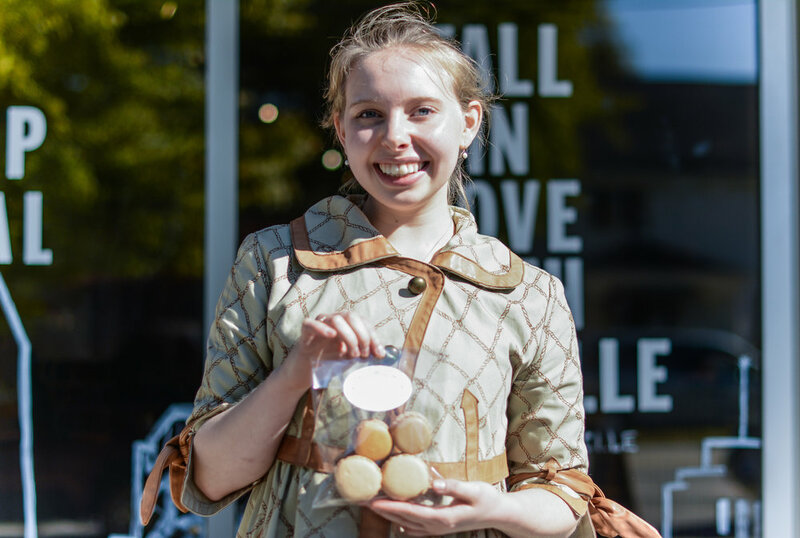 Ciel Smith shows off her own macarons, and her new company, Patisserie De Ciel. We had an amazing time hosting our first event at House Of! Stay tuned to hear more about House Of’s next event in November.